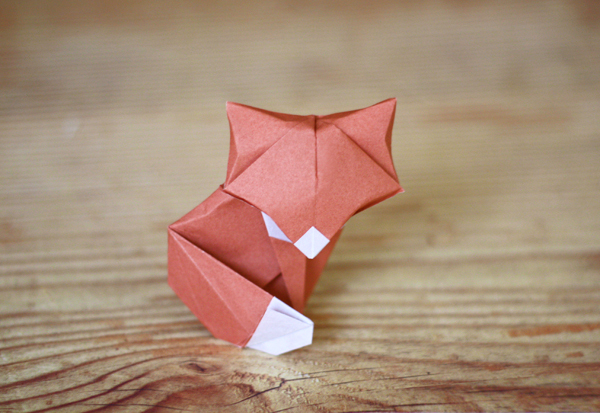 I tried folding another origami fox model. There was something about the tail I couldn't figure out between steps 22 and 23, but I like him anyhow. Find this Fox Baby diagram here, designed by Daniel Chang and diagrammed by Marc Sky. That is a really cute model! These are so adorable. I love them all! He's adorable! I tried the other one - he cam out okay, I think I used paper that was too thick! This is adorable. I so wish I was better with origami. Have always loved it, but I stink at it. You might need a thicker paper to do "push" its face like a construction paper. I think it might be difficult to make with a regular origami paper, even a regular printer paper. I also got stuck on the tail... Cute none the less! If I make one again, I'll try to remember to leave a comment about that step. But.... it might be awhile! I think the angle change in the picture is what makes the tail look different. They didn't fold it, they're just trying to draw it from a top angle. "zooming in closer and above the head"
the instruction is not clear at all! I failed to finish it. p.s. I'm not a beginner in origami and folding. im a beginner and im 12 so don't judge but what does question 13 mean... I don't get how it can become the white side of the paper from the pattern side. Could someone try to explain how they did the tail? Man, I can't figure out 18. Can I commission you to make two of these in mirror images. I would like to do them in a shadow box with a frame for my Anniversary as a gift to my wife. If one is slightly larger than the other then even better. This model is unclear and hard. The steps should be more clear and more easy to understand. I am not a beginner in origami.